Diminutive of midge (from Old English mygg, mycg (“gnat”), from Proto-Germanic *mugjō, from Proto-Indo-European *mus-, *mu-, *mew-; cognate with Dutch mug (“mosquito”) and German Mücke (“midge, gnat”)), using the suffix -et, originally (1865) for a "little sand fly", only around 1869 also a "very small person". Portrait of Sebastián de Morra (c. 1645) by Diego Velázquez. 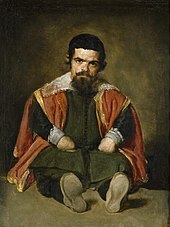 The subject of the painting, a midget or dwarf, was a jester at the court of Philip IV of Spain. Although tiny and just two-winged, midgets can bite you till you itch all over your unprotected skin. (sometimes derogatory) Any short person. (attributively) A small version of something; miniature. Used for an insect, this is a variation on midge that is incorrect but commonly used. person of small stature of adult height less than 4'10"